Math Professor Helps Uncover Art Fakes Professor Daniel Rockmore is an art lover — and the chairman of the math department at Dartmouth College. He has united his two interests, art and math, to develop a program that analyzes pen strokes. The program gives art historians a new tool for detecting art forgeries, which are estimated to make up 20 percent of the worldwide art market. 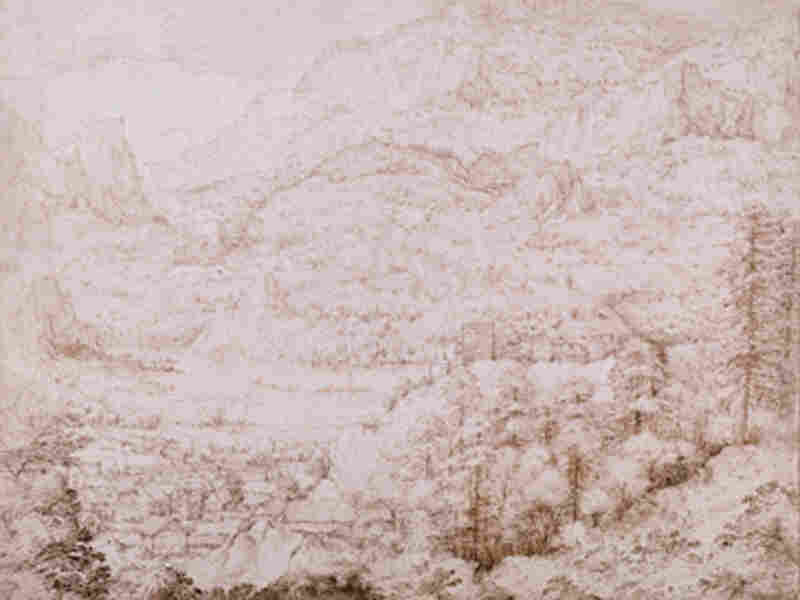 This drawing of an Alpine landscape was until recently attributed to the Renaissance-era artist Pieter Bruegel the Elder of the Netherlands, who lived from 1525 until 1569. In 1991, art historians began to suspect the work was not authentic because its watermark has been associated with papers not documented before the mid-1580s. Determining what is real and what is fake has long been a problem for art curators. It is estimated that 20 percent of the worldwide art market is made up of forgeries. But art lover and Dartmouth College mathematics department Chairman Daniel Rockmore has developed a technique that is helping to determine the difference between excellent copy and the real McCoy. "I joke a lot that I am a mathematician by mistake," says Rockmore. "It was something that I had an aptitude at, but I've always had lots of interests." One thing Rockmore is particularly interested in is art. And a few years ago, his professional skills and personal interest collided. In 2001, through a friend, Rockmore met Nadine Orenstein, a curator of prints and drawings at The Metropolitan Museum of Art in New York. At the time, Orenstein was working on an exhibition of the work of Pieter Bruegel the Elder, a Flemish painter from the 16th century. She invited Rockmore to the museum to see the show. The exhibition featured both drawings by Bruegel and several that had long been attributed to him, but that historians later suspected were drawn by others. "Our exhibition was really the first time we were getting together in one place all of the drawings by Bruegel and the ones that were no longer considered to be by him," says Orenstein. Rockmore says it was at this exhibit that he realized how his mathematical training could intersect with his love of art. "Nadine was explaining to me the various pen strokes that seem to be characteristic of the way Bruegel works, the way he creates a scene," says Rockmore. He realized that if he had digital images of the drawings, he could use his math skills to design a computer program that would analyze the pen strokes and characterize which were Bruegel-like and which weren't. So he and some colleagues got hold of the digital images, and wrote the program. By 2004 they had a program that was pretty good at identifying real Bruegels. And now, as Rockmore reports in a recent edition of the journal Proceedings of the National Academy of Sciences, the program has been further improved through the use of a different kind of statistical sampling technique. The program determines whether a particular drawing is consistent with an artist's style. Until now, Rockmore has only tested his program on Bruegel drawings, but he says there is no reason it could not be used for other artists. While it can identify suspicious works, it cannot definitively prove that they are fake. But, says Orenstein, it "might kind of put a little light bulb in the head of the scholar and say, 'Oh, here's something we need to further investigate.' "
In the end, Rockmore doesn't see his work as leading to a way to track down forgers but rather as a tool to deconstruct art — a way of describing what it means to be Picasso-like or Bruegel-like. "You get deeper questions about the creation of art, and our experience of art," he says. "But it's probably more fun to report on whether or not that's a fake Bruegel." Although reporting on the science of how we experience art is fun too.